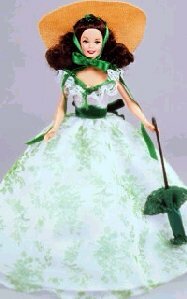 This series features three Barbie dolls as Scarlett O'Hara dressed in here signature dresses from the movie Gone With The Wind. Dolls were released from 1994-1996. Only Scarlett Hara could look stunning draped in lush green billows of fabric that once hung as curtains. 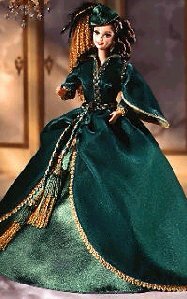 Her ensemble is accented by golden trim and a matching green hat with golden trim. Sparkling emerald eyes and rooted eyelashes compliment the rich colors of the dress. Barbie as Scarlett is ready to attend a fun and fancy barbeque in this lovely dress. She wears a flowing white gown with green floral print, a green parasol, and a wide-brimmed "straw" hat. 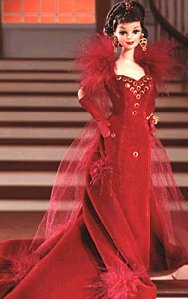 Attending Ashley's birthday party, Scarlett is sure to turn heads in this gorgeous red velvet gown with marabou feathers. Her hair is styled in lovely brown ringlets, and golden accessories include drop earrings and bracelet.